The music of J.S. Bach is transformative and hearing one of the foremost interpreters of his music is an immense delight. Angela Hewitt takes Bach and places his work with exuberant prowess that is so difficult to do, yet she accomplishes effortlessly. SOLO / Portland Piano International is proud to announce the 42nd season of its SOLO Piano Series. Marc-André Hamelin, this year’s curator, has selected six artists, each of whom will perform two completely different programs over two consecutive days. Italian-Australian pianist Jonathan Ferrucci is Portland Piano International / SOLO’s next Rising Star, set to perform April 13, 14, and 20. Have you considered signing up for Piano Day, but not sure what to play during your time? Sometimes the decision can be overwhelming, especially with the breadth of options. If you don’t already have a number of pieces in your musical toolbox for emergencies (such as when someone asks you to “play something” when they learn you are a musician), here are five relatively easy, but equally impressive pieces. Try some of these out for our Piano Day on March 29. Sign up now! Whether you are a professional or an amateur, the love for the piano runs deep. There is a special connection and camaraderie among pianists, from Bach and Beethoven to the neighbor down the street. This weekend, MAR 16 / 17, we are hosting renowned British pianist Benjamin Grosvenor for our next SOLO series performance. Portland Piano International has organized an ultimate two-week visit to Italy that will delight anyone who loves the piano, fine food, the good life, and all things Italian! This trip coincides with the Trasimeno Music Festival, created and directed by renowned pianist Angela Hewitt. Celebrate Piano Day 2019 With Us! 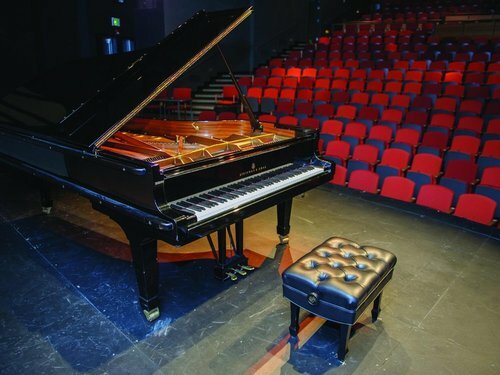 This year, Portland Piano International / SOLO celebrates Piano Day on March 29. Piano Day happens on the 88th day of the year because the modern piano has 88 keys. Last year 70+ individuals performed 1,590 minutes of music on Piano Day and helped raise more than $20,000. The hope is to surpass this milestone of persons, minutes and donations. British pianist Benjamin Grosvenor is a connoisseur of musical styles. He likes “too much music”, as he puts it, to focus on one particular style. This expanse of curiosity paid off in Grosvenor’s latest album, Homages. This SUNDAY / FEB 24, our partnership with Chamber Music Northwest will bring together two great pianists, Shai Wosner and Orion Weiss, for a special duo concert at the beautiful Congregation Beth Israel. Benjamin Grosvenor’s mastery on the piano will take your breath away. We can’t wait to host the renowned British pianist on MAR 16 / 17. We are excited for our next program with Chamber Music Northwest on SUN / FEB 24, when two fantastic concert pianists, Shai Wosner and Orion Weiss, grace us with their collaboration at Temple Beth Israel. On SUN / FEB 24, two excellent concert pianists, Shai Wosner and Orion Weiss, will combine their talents into a masterpiece of an evening as part of our collaboration with Chamber Music Northwest. This stunning program will be the first-ever concert in the acoustically superb Temple Beth Israel, considered one of the finest examples of Byzantine-style architecture on the West Coast. Portland Piano International / SOLO presents three public hour-long performances by Rising Star Italian pianist Filippo Gorini from February 9 to 11, 2019. Behzod Abduraimov performs in Portland this weekend, SAT / JAN 26 and SUN / JAN 27. Hear his world-class artistry displayed in Liszt’s momentous piano work, the B minor sonata. But first, listen here to his extraordinary “La campanella” encore from the BBC Proms. In these present concerts, it seems to me, the astonishing young Uzbek pianist Behzod Abduraimov has invited us back to one of the “golden eras” of the piano, the one that is usually called “the great Russian tradition.” Of course, not all the music on these programs is by Russian composers (Liszt was Hungarian, for instance, and Wagner a German), but the characteristic feats of superhuman technical virtuosity, utterly voluptuous sensuality and drama in both melody and overall structure of the composition, and great eruptions of anxiety, pathos, passion, and transcendence are all here in over-abundance. This is music that came into being at the dawn of modernity, if we may by that term mean the beginnings of scientific understanding of the mind and human impulses (psychology), the utter transformation of work away from agriculture and craftsmanship toward industry and the increasingly fast pace of everyday life, and, in European culture, a growing focus on the individual artist and her or his soliloquy on meaning and personal experience. On SUN / JAN 27, Behzod Abduraimov will team up with his former teacher, Cliburn Gold Medalist Stanislav Ioudenitch for a performance on two pianos. An Uzbekistani-born American pianist, Stanislav has studied and performed all over Europe, the United States and Asia, as well as collaborated with top musicians and conductors. SOLO / Portland Piano International has announced the Finalists for the 2019 Youth Piano Concerto Competition. For the last 90+ years, Portland Youth Philharmonic (PYP) has held a biennial piano concerto competition, with the top prize of performing with Portland Youth Philharmonic. Last spring PYP asked Portland Piano International / SOLO to take on the running of the Competition and increase public awareness and involvement in the Competition.